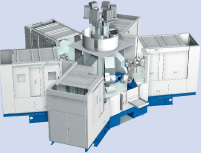 For many years, rotary transfer machines were regarded as single-purpose machines. In periods of market uncertainty, the advantages of such production systems regarding quality and productivity do not outweigh the investment risks. This provided the motivation for designing the LiFLEX rotary transfer machines. The productivity improvements of a rotary transfer machine are combined with flexible machining units that have 3, 4 or 5 axes, as well as an additional innovation from the incorporation of dry or MQL machining.